This is under constant development, Mateys! During the "season" we have loads of extra hook-handed peg-legged little elves in the warehouse making sure things get shipped as soon as possible and absolutely in time for gift-giving events! DURING the HOLIDAYS and right up until Dec 21st, most (if not all) orders will leave our shop in 1-3 days! BUT it is ALWAYS a good idea to ORDER EARLY! US West Coast: Dec 21st: The US Post Office states that priority shipping that ships before 5:00pm will arrive monday before xmas....but if you wait until friday to order - while we will try our best - we cannot guarantee your order will go out the same day. It's a good idea to contact us before ordering ON friday the 21st if you hope to get your order before xmas! Our standard current time until we ship out an order is 2-10 business days - that's BUSINESS days me buckos (mon-friday. [we try not to make our overworked crew work on the weekends!] (we're always working to speed up our shipping process - but we are getting a LOT of orders right now). We often CAN expedite an order if you really need it for a special ocassion - please email us and ask if you NEED it sooner. We also often arrange for special shipping options for thems what gotta have it now - yarrr! Note: 2XL & 3XL sizes can *sometimes* take up to an extra week to ship. Do You Deliver outside the US? As sure as Davey Jones is at the bottom o' the Sea - yes! BUT - the default shipping you will be charged is for ground and that's pretty slow. We recommend that at checkout you choose the "Global Priority" option - or email us for other shipping choices. We want you to be 100% happy with your PirateMod purchase! If it doesn't fit we will exchange it for another size of the same shirt with no restocking fee whatsoever. If there is anything wrong with the shirt (defective, wrong) we will refund your purchase upon receipt of the shirt. However we cannot exchange one product for a different item - only for size issues. Refund requests must be made within 30 days. Sorry, but at this time our manufacturing facility is not open to the public. If you want to see our lines in person please email us and ask if there is a store near you that carries PirateMod - we're happy to assist! Where can I buy PirateMod locally? See above - if there isn't a store near you that carries our products, ask them WHY NOT? And then tell us to send them wholesale information! Some of the models on your site are wearing cool frock coats and pirate hats - can I buy these things too? 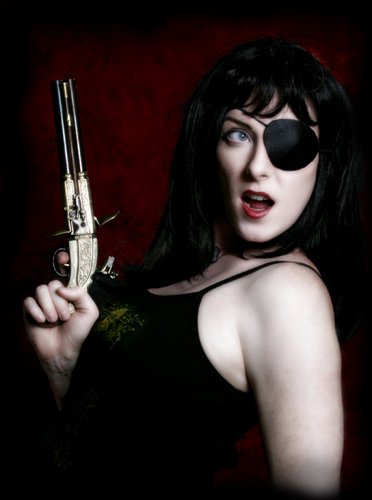 We don't currently stock traditional pirate costuming or weaponry. But if you check out our links page there are several good sites that have costume patterns, sell these things, or will even custom design them for you...for a price, bucko!